I have had the privilege of getting an exclusive look at the new developer community and toolkits that Salesforce will be launching at the eTech conference tomorrow. 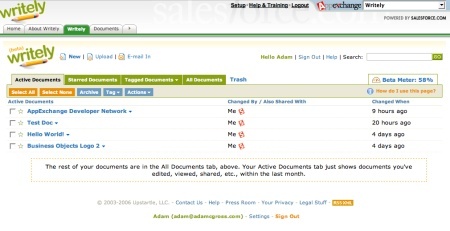 Salesforce have been on the cutting edge of what we now call Web 2.0 in the business space for years. They were trying to swing mindset towards software as a service and the web as a platform long before we had the terms that we use today to describe these technologies and ideas. Salesforce has grown to become much more than just a CRM application and is now a platform for business collaboration and communication on the web – allowing developers to build applications on their platform and giving their 399,000-strong customer base access to these applications. The best indication of the growth of Salesforce as a platform has been that now over 40% of requests to Salesforce web servers are SOAP requests to their API. AppExchange is the application platform at Salesforce and today its library of applications has over 160 applications listed within it, all of which are available to Salesforce customers. At eTech Salesforce plan to announce the launch of their new developer community – the AppExchange Developer Network, which provides developers with the community, tools and resources to let them build applications for AppExchange. Salesforce will also be announcing the availability of toolkits for both PHP (supporting the native SOAP libraries in PHP5 – developed in collaboration with Zend) and something that is very exciting, a RubyOnRails toolkit called ActiveSalesforce. Salesforce refers to what we know as Web 2.0 in the consumer space as ‘The Business Web’ in the business space. The technologies and ideas behind Web 2.0 such as Ajax, SOAP, Software as a service etc. all started out in the business space and their breakout into the consumer space resulted in the Web 2.0 we know today. While businesses and products such as the early Salesforce were the instigators and drivers popularizing the technology the growth of the consumer Web 2.0 resulted in the business space being forgotten. The purpose of the AppExchange Developer Network is to make it much easier for developers of mashups and other applications to apply their skills in the business space and to have their solutions showcased to the large user base that Salesforce has. Create – using the toolkits available (Ajax, PHP, RubyOnRails, Java, Perl, etc.) and the resources (sample code, online presentations, podcasts, the forum etc.) create your application using your free developer edition account. Succeed – most importantly, you have a business opportunity with the applications you build. Here you can work together with Salesforce in promoting your solution and succeeding. There are a number of possibilities, for instance a expense report application could integrate with PayPal to settle payments with employees and send them back notifications (just one idea). Salesforce offers all this to developers and asks for nothing in the form of a payment, or even a revenue share. There are a number of successful applications in AppExchange right now, and a number of businesses who have products exclusively on AppExchange and do very well from it. An example is a company called DreamFactory which was founded by Bill Appleton. DreamFactory has released a number of products for AppExchange such as DreamTeam, a project management application. At Techcrunch each week we see so many new products each week that are jumping into very crowded spaces (such as online calendaring, and our favorite, Ajax desktops) that have no clear revenue model. More of these companies should consider the business space and what Salesforce has to offer developers with AppExchange. The cost of getting your product onto the platform is zero, and the huge amount of resources makes it very simple to do. I also got an exclusive look at some of the new applications in AppExchange that will be released shortly. These are all mashups of services that we know now with Salesforce. The first example was the Google Maps mashup, which displays on a map the location of your leads or contacts. This mashup was developed using the awesome Ajax toolkit which allows the application to be hosted in the client – meaning the developer of the mashup doesn’t need a host server. The other exciting mashup was Salesforce integration into Skype. 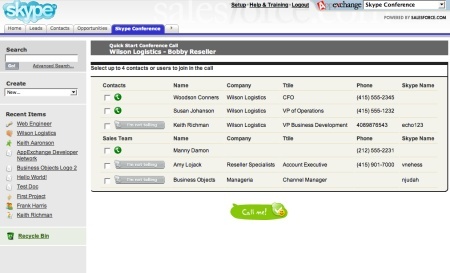 What the user does is selects who they would like to call or invite into a conference then press a ‘call’ button and it will dial out over Skype to these people and setup a conference. You can mix-up Skye usernames that you have stored against a contact with ordinary phone numbers and it will take care of it. Another mashup that I saw was the integration of Salesforce with the online word processor Writely. When this is launched Salesforce customers who store their documents on Salesforce will be able to open them with Writely and save them straight back to Salesforce again. Yet another mashup which again was very simple and effective was integration with the Adobe online PDF generator, allowing you to create PDF’s from sources within Salesforce and having them save back to your account. These mashups all had one thing in common – they are an elegant combination of two great services that combined prove to be a very effective solution to common problems for business users. I could spend a lot of time talking about AppExchange and Salesforce and I don’t feel that a single post can do them justice. 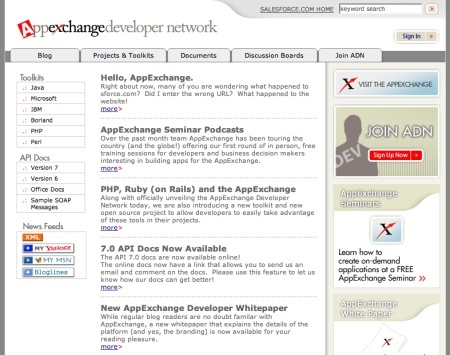 What I do hope is that with the announcement of the new AppExchange Developer Network and new toolkits that make it very simple to write apps, that more and more developers will consider joining the community at Salesforce and developing not only products but businesses on top of Salesforce. I know I look forward to reviewing more applications in the future that are built in Salesforce.